This book debuted in November 2017 in print format. It is now available in print and ebook formats. "I was pleasantly surprised that this was not just another biographical diving book. Leo's life is inspirational to all of us, whether we are divers, cancer survivors, or struggling with any of life's challenges. I could not put this easy-to-read book down." "Leo's courage and persistence is amazing and inspirational." "The perfect gift for anyone needing strength, support, and inspiration." If you ask Leo Morales, nothing is impossible if you set your mind to it. And he should know. After he lost his right leg to cancer, Leo struggled with life. But he decided his disability would not define him. When friends suggested scuba diving as part of his physical therapy, he was hooked. He quickly progressed from diver to dive instructor and technical diver. Leo has set two world records as a disabled diver, one for depth and one for distance underwater, and tirelessly travels to share his message that disabilities are only in the mind. 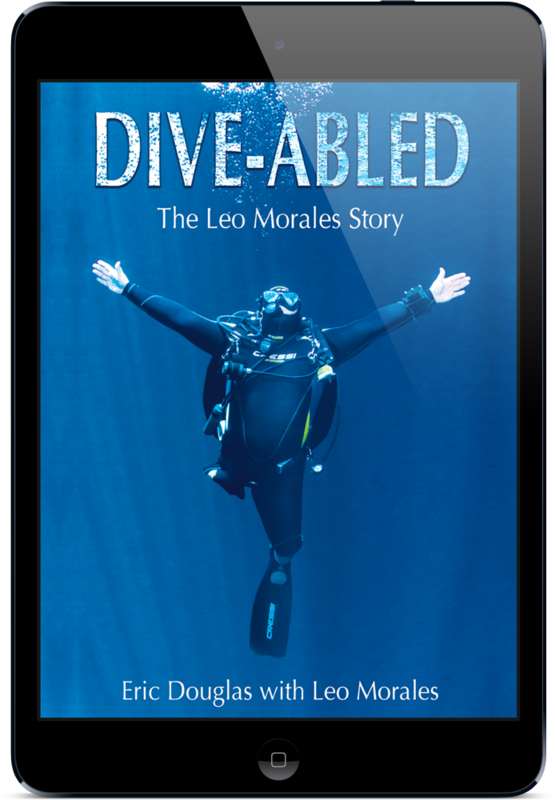 Leo Morales is a disabled diver and an international English-Spanish motivational speaker. Currently, he is preparing for a third world record for scuba diving in a cenote in Quintana Roo. He is an ambassador of the international diving brands PADI, Cressi, XDeep, and Intova. In 2016, Sports Illustrated included Leo in a list of people in sports with disabilities. Through his foundation, Open Sea, he promotes diving for people with disabilities. Life is an adventure for author Eric Douglas, above and below the water and wherever in the world he ends up. Eric received a degree in journalism from Marshall University. After working in local newspapers, honing his skills as a storyteller and following a stint as a freelance journalist in the former Soviet Union, he became a dive instructor. The ocean and diving have factored into all of his fiction works since then. Eric is the former Assistant Editor of PADI’s The Undersea Journal, the former Director of Training for Divers Alert Network, and is currently the Lessons for Life columnist for Scuba Diving Magazine. He co-authored the book Scuba Diving Safety with Dan Orr. "Leo Morales's infectious smile and boundless enthusiasm are only a few of the traits that make him a standout personality in our sport and industry. As he will tell you, 'Scuba diving saved my life.' He has enriched the lives of countless others who, because of him, have realized scuba diving is a truly inclusive sport where a person is judged by abilities not limitations." "Leo has transformed lives by opening the doorway to a world below the surface of the water filled with wonders and excitement not found anywhere else on earth. Leo’s story is both inspirational and motivational. Our sport and our lives are better because of him. Enjoy the read and let Leo’s story inspire you to achieve your dreams!"